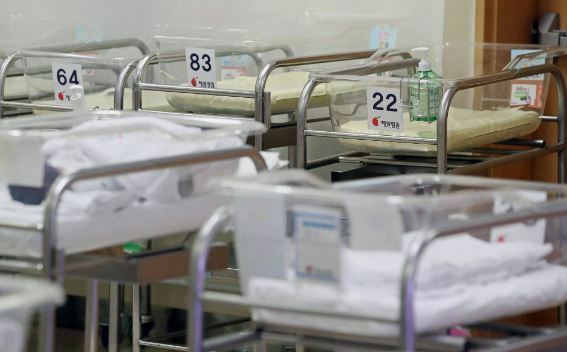 South Korea's fertility rate probably fell below the critical level of 1 to an all-time low in 2018, an official said Friday. The country's total fertility rate is estimated at 0.96 to 0.97 for last year, said the official at the Presidential Committee on Aging Society and Population Policy. An estimated 325,000 babies were born in 2018. Last year's total fertility rate marks a fresh record low and is far below the replacement threshold of 2.1. The total fertility rate refers to the average number of babies that a woman is projected to have during her lifetime. In 2017, South Korea's total fertility rate hit an all-time low of 1.05, ranking last among members of the Organization for Economic Cooperation and Development. Gripped by the stubbornly low birthrate, South Korea's population is widely expected to start declining in 2027. Last year's drop in the total fertility rate is feared to accelerate the country's so-called demographic cliff: a major drop in the working population amid low birthrates. The proportion of South Korea's working age people, aged 15-64, to its total population began to decline after peaking at 73.4 percent in 2016. Coupled with a rapidly aging population, a low birthrate cuts the available workforce in the country, driving up welfare costs and undermining economic growth potential, according to experts. Over the past 13 years, the government has unveiled three packages of measures to tackle the ultra-low birthrate, including measures to encourage people to have more children by offering various incentives, such as cash rewards. In December, the presidential committee announced a policy road map that focuses on improving people's quality of life rather than encouraging women to have more children.